Back in 1996, I was a member of the team from Venice High School in Los Angeles that won the Department of Energy's National Science Bowl Championship in Washington D.C. Our winning team (seen in the photo to the left with our coach) was presented with a most challenging dilemma: our choice of prize. The top prize according to the sponsors was a week-long trip into the heart of Alaska where we could observe a working petroleum research center. Our other choice was a visit to Berkeley Lab. 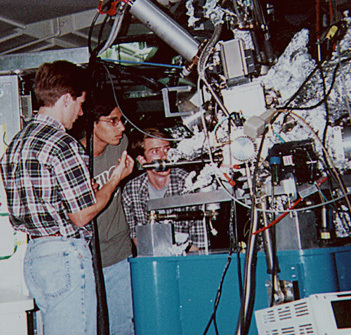 As Californians used to warm weather we naturally shuddered at the thought of spending part of our summer freezing in some arctic backwoods, so our choice of the mysterious Advanced Light Source at Berkeley Lab as our "prize" destination was easy. This in spite of the fact that none us even knew what the ALS was! As soon as we arrived at Berkeley Lab, ALS staff and scientists introduced us to the inner workings of the ALS from linac to beamline to experiment endstation. This was followed by an overview of the different kinds of research done here. We also had the chance to work side-by-side with members of ALS engineering, scientific, and survey and alignment staff. Near the end of the week, we split into two groups--one went to Beamline 6.1.2 with John Brown to look at the parasite that causes malaria using an x-ray microscope, while my teammate David Dickinson and I joined Eddie Moler and his colleagues on Beamline 9.3.2. Although David and I, shown at right getting our first look at an experiment endstation, only participated in a small part of an experiment, it amazed us how all of the features and effects we had been discussing and reading about showed up as a piece of concrete data. 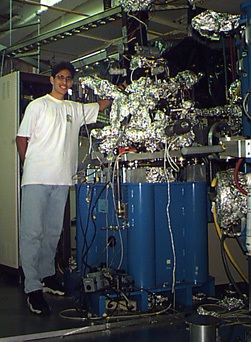 I was so impressed by this experience that a year and a half later, my first idea of what to do for the summer was to come back to the ALS and work on that beamline! My work this summer is focused on preparing and characterizing samples of thin organic films using the experiment endstation on Beamline 9.3.2. To determine the structure of these films, we use a technique called photoelectron diffraction (explained below) that requires our samples to be both smooth over small length scales and relatively well-ordered over longer ones. Right now, a lot of my time is spent trying to fabricate a smooth surface on which to deposit the one- or two-molecule-thick layers that constitute our films. In the picture below you can see a few of my many attempts at atomically flat substrates. Later on in the summer we'll place the film sample inside the experiment endstation and focus a beam of x-ray light from the ALS on it. When the x rays encounter the thin film, they will knock the electrons out of the atoms on the surface of the sample. This is called photoemission, which is named for the photoelectric effect. The ejected electrons, called photoelectrons, scatter off of neighboring atoms and produce a diffraction pattern in the process. Just like an optical diffraction pattern, this photoelectron diffraction signal may be "inverted" to reveal the structure of the film's surface. 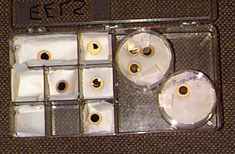 Eventually, the films will be studied in a water vapor environment to gain a better understanding of the water-film interface. This information could then be generalized to similar but more complex systems such as biological membranes. Amazingly, the simple experiment that I am participating in this summer will perhaps contribute to our understanding of very real and complicated phenomena. However, I've learned from working here that the simplifying approximations and error allowances that one makes as part of the real world of research must be constantly scrutinized to insure that one's "wonderful results" truly represent reality. This vigilant objectivity is the hardest part of my job. I sometimes long for the certainty of an answer "in the back of the book," but science, I now realize, is almost as focused on the process by which results are obtained as on the results themselves. Nonetheless, I sincerely hope our experiments will turn out well in the weeks ahead!